How Long Does It Take to Get Good at Drums? How long typically does it take a average person to become good at the drums. I have been playing for 3 yrs and sometimes get frustrated with my performance. There is no "average" time for a drummer to become "good". There are too many variables. 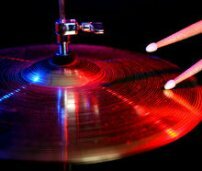 For one thing, your definition of "good" changes as you improve your drumming skills. This is a good thing because were it not so, you would be content to remain at the same level for the rest of your life. Frustration with your current level of playing is a very common and a very valuable experience for a drummer. Just think about this--If you weren't dissatisfied with crawling as a baby, you would never had learned to walk. The best advice I can give you is to isolate which abilities and skills you feel that you need to improve and then make every effort to find the resources that will help you in those areas. You might also want to join a couple of drumming groups on Facebook if that is something that you use. It really helps to see what experiences other drummers of different levels are having. You can also improve your skills dramatically by playing your favorite songs EXACTLY as they are played on the recording. Copying drummers that you admire is one of the best ways to improve your drumming. We offer guaranteed accurate drum transcriptions for ANY song. Just visit Almost Free Drum Tabs. Comments for How Long Does It Take to Get Good at Drums?